C Ribet Abstract Nature Photography subdomain is up. Mini slide shows of C Ribet Absract Color Photography and abstract photos for sale online are previewed selectively. At the C Ribet Zenfolio online art gallery you will find not only mushroom art for sale by artist C Ribet but also California oaks and landscapes, African animal wildlife and a huge variety of real and abstract Dewscapes and Mizzlescapes of exteme close up macro photography of water on decaying plants and organic materials which present a unique form of abstract photography ranging from bold and vivid to delicate soft and contemplative images. Collect and manage your own image sets and personal collector account at the C Ribet Zenfolio online art gallery. Mushroom kingdom. Fungus kingdom. Fungi kingdom. Mushrooms, fungi! What's the difference? 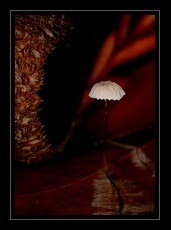 The words fungus and mushroom or fungi and mushrooms are often freely substituted for one another. Fungi kingdom is mushroom kingdom and likewise mushroom kingdom is fungi kingdom. Common usage often doesn't really distinguish much between the two terms mushroom and fungi, but there is a difference. 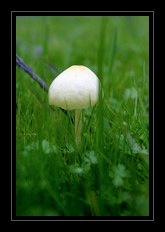 Properly speaking a mushroom is a fruitbody of a fungus. When you inspect a wild mushroom or a troop of wild mushrooms, you may never see the underlying fungus at all. It may be hidden under the soil or concealed out of sight inside the bark of a tree or stump from which the mushrooms spring forth. Without the fungus, there would be no mushrooms at all. The fungus multiplies when the mushroom releases spores which land in a nourishing spot and germinate. If conditions are right, the fungus will continue to grow over many many seasons. This fact that the mushroom is just the fruiting body, and not the long-lived organism itself, is why if you are out mushroom picking, and you are very careful to remove only the mushroom and not disturb the underlying fungus body (the mycelium) you should be able to return again to the same spot for more mushroom picking the next season. On the other hand, if in your mushroom picking you carelessly uproot the mushrooms by ripping and pulling out the mycelium, you will likely damage the fungus itself, and you may kill it and never find it in that spot again.